Tooth decay and gum disease are like schoolyard bullies. They pick on some of us more than others. 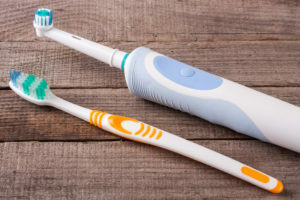 Keeping them at bay means brushing and flossing, using dental rinse, watching what you eat, and seeing your dentist for regular cleanings and checkups. The human body is a marvel of nature. Not only does it keep us going throughout our lives, it has a state-of-the-art security system that guards us against threats. In this case, those threats are microscopic bacteria, like the kind that cause tooth decay and gum disease. Ridding your body of these invaders for good and all is impossible. So we do the next best thing. We limit our exposure to them through habits like brushing and flossing. But these practices will only do a limited amount of good unless we also watch what we eat. That’s because harmful micro-organisms live on sugar and starch. They harvest it from food particles in your mouth. The only way to keep them from gassing up is to limit their access to fuel. This is why dentists talk so much about avoiding sugary foods. But simple starches like pretzels and potato chips pose much the same risk. While we’re on this topic, we should mention the other side of the coin. Your diet should include fresh fruits and vegetables, lean protein like chicken, turkey or tofu, and calcium sources like reduced fat milk, yogurt, and cheese. Your body uses the nutrients in these foods to keep your teeth strong. All tobacco products carry with them enormous risks, not only to your teeth and gums but to your overall health. Talk to your dentist about new medications that can help you to stay tobacco-free for good. Drinking acidic beverages. Coffee, tea, soda, etc., can erode the protective enamel lining of your teeth, putting you at greater risk for cavities. Excessive alcohol consumption can have much the same effect. Hanging onto your toothbrush for too long. Most dentists recommend 90 days as a good ballpark for switching to a new brush. Improper brushing or flossing technique. Ask your dentist for tips on this important topic or check out some of the many helpful, professionally prepared videos you’ll find online. Some of us are more cavity prone than others; that’s a simple fact of life. But all of us can reduce our risk for tooth decay and gum disease by following the tips outlined in this post. All the best you and yours, both now and down the road. Dr. Nelson Y. Howard has been practicing dentistry for more than 30 years. His range of practice includes general, restorative, cosmetic, and implant dentistry. You can reach his office online or by calling (760) 599-6559.